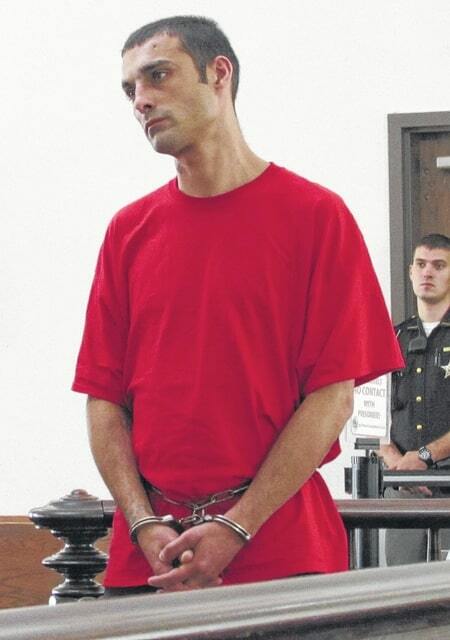 Steven R. Mottie Jr. is pictured in Highland County Common Pleas Court on Wednesday. A Hillsboro man recently arrested on a warrant for failing to appear in court has been sentenced to 18 months in prison. Steven Robert Mottie Jr., 33, pled guilty in two separate cases on Wednesday to one count of aggravated possession of methamphetamine and one count of heroin possession, both fifth-degree felonies. According to the plea agreement, the state and defense jointly recommended nine months in prison on each charge. Highland County Common Pleas Court Judge Rocky Coss followed that recommendation, and ordered that the prison terms runs consecutively. Prosecutor Anneka Collins said Mottie has two previous felony convictions for drug trafficking, one of which he served prison time for. Also part of the plea agreement, according to Collins, was that Mottie would not be indicted for not appearing for a May court hearing. Court records show he was arrested on that warrant early this month. In other hearings, Patricia Darlene Santrock, 67, Hillsboro, pled guilty to fifth-degree felony trafficking in drugs. She will be sentenced in August following a presentence investigation. According to the plea agreement, the state dismissed a fourth-degree felony count of aggravated trafficking in drugs. Also within the agreement is that the state will recommend community control and treatment. Melvin M. McKenzie, 36, Hillsboro, recently admitted violating his probation by using meth. He is scheduled for sentencing in July following a presentence investigation. McKenzie was initially granted intervention in lieu of conviction a year ago after pleading guilty to aggravated possession of meth, a fifth-degree felony.